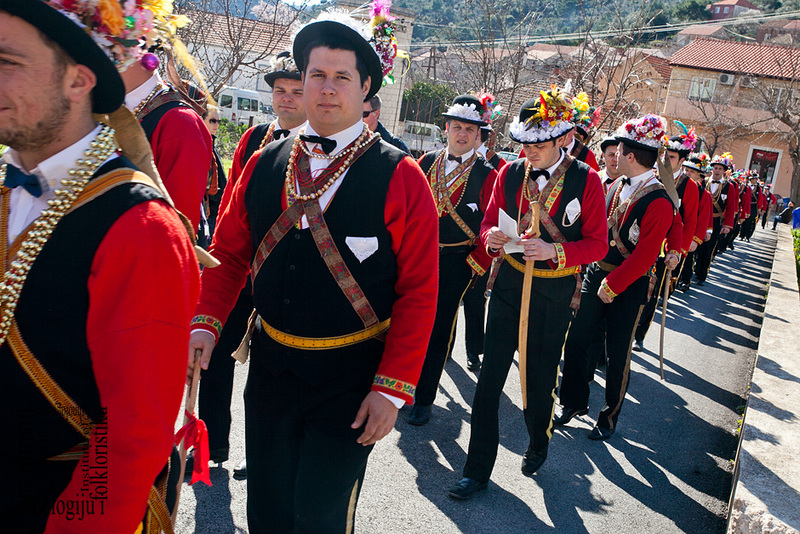 The Lastovo Carnival season starts on St Anthony’s Day on 17 January, and lasts until Ash Wednesday. If the carnival group decides so, balo (dance evenings that take place only during the carnival season) can start as early as Epiphany (Three Kings’ Day), but this happens in exceptional cases only. On St Anthony’s Day, regardless of which weekday it is, the first dance evening is held. 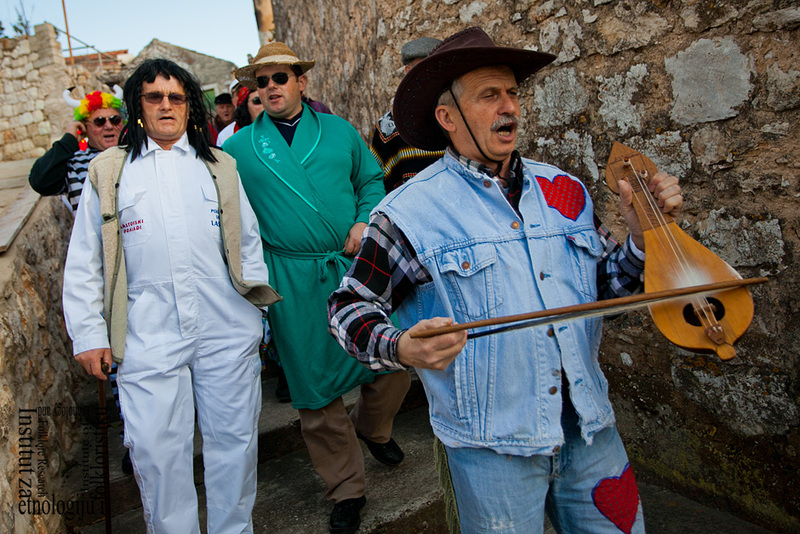 The Hall Master (kapo sale) welcomes the local people and special guests – the head of the municipality, doctor and priest – and announces the beginning of the carnival festivities. From this evening on, the masked participants (maškare) are allowed to take part in all the carnival events. On Candlemas Day on 2 February, the lyre “comes out”. With its distinct, clear and strong sound, it will accompany all the important Carnival moments and activities until Ash Wednesday, when the carnival magic disappears, and the village returns to its quiet everyday routine. The lyre, or lijerica,is a stringed instrument played solo that typically accompanies dance and, less often, singing. 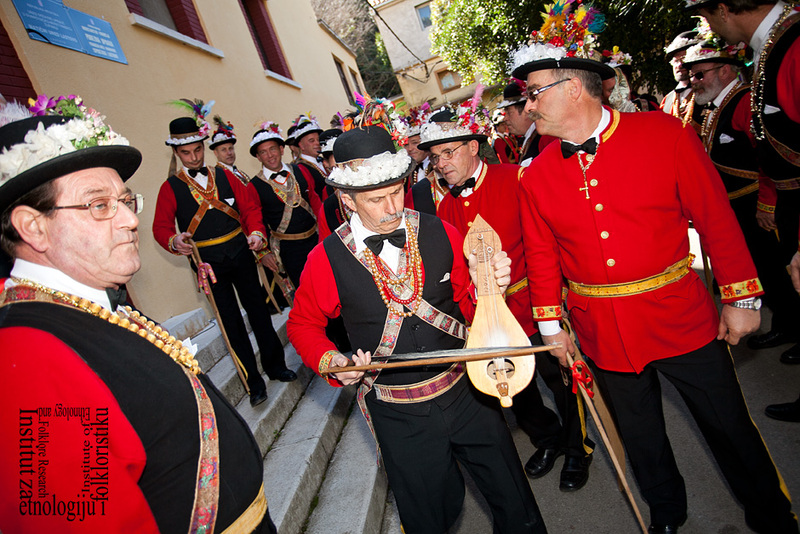 On the island of Lastovo, the lyre is played only during the Carnival season. 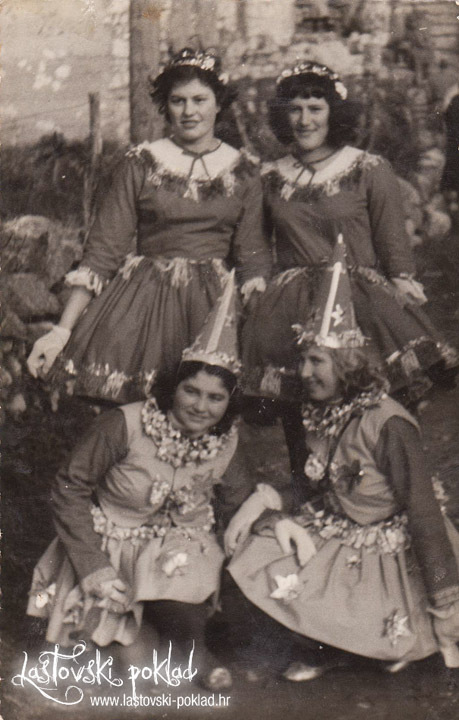 On Candlemas Day, several members of the carnival group gather together to call “Uvo!” near a tree in a part of the Lastovo village called Gornja Luka. This characteristic calling of the carnival exclamation “Uvo!” three times in a row is called halekanje. 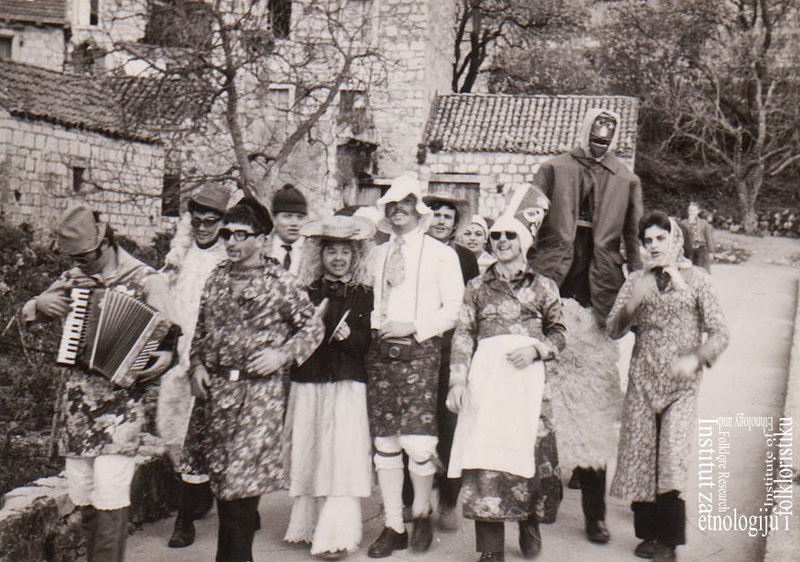 “Uvo!” is a mysterious exclamation whose origin has not yet been explained, and is an integral and obligatory part of the Lastovo Carnival custom. The procession is led by the lyre player, followed by the Hall Master and by carnival group members walking in pairs. The procession then divides into two groups to sing the song A Small Group Went into Battle (Podiglo se malo četovanje). The Hall Master calls out each line of the song, and the two groups repeat it, singing in turns and accompanied by lyre. 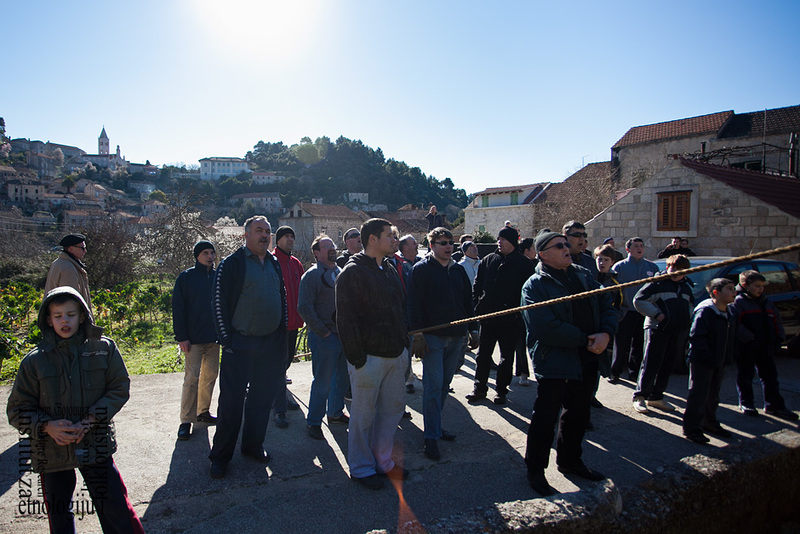 They sing while walking to their first stop, Gornja Luka, a part of the village where there is a rock to which they will tie a rope (uza) on Shrove Tuesday. The music and singing stops while they walk past Sts Cosmas and Damian Church, where there used to be a cemetery. When they reach Gornja Luka, the procession stops and the two groups call “Uvo!”, first each group alone once, and then together. After that, they go to the house of the Poklad puppet maker, singing along the way. They call “Uvo!” there in the same manner again, after which they return to the Hall. If they finish the song A Small Group Went into Battle, they continue with the song A Green Orange (Zelena naranča). Before entering the Hall, they call “Uvo!” one last time, after which they have dinner and dance. After the calling of “Uvo!”, the lyre is permitted to enter the Hall, and it is an obligation that it be used to accompany all traditional customs until the end of the Carnival. If a dance evening (balo) should fall on Candlemas Day, it is postponed until the following day – St Blaise’s Day. In the past, when there were several carnival groups in the village, the group that had gained the honour of being entrusted with the Poklad puppet organised dinner at the Hall and went out to call “Uvo!”. 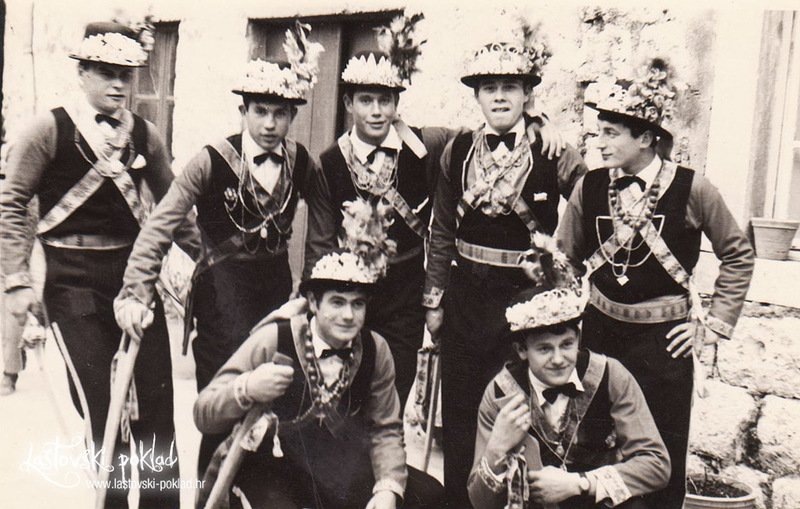 During the Carnival, the group must go and call “Uvo!” by the tree in Gornja Luka three times: on Candlemas Day, on Carnival Thursday, and on Carnival Sunday. However, “Uvo!” can also be called more often as long as customs are being respected. 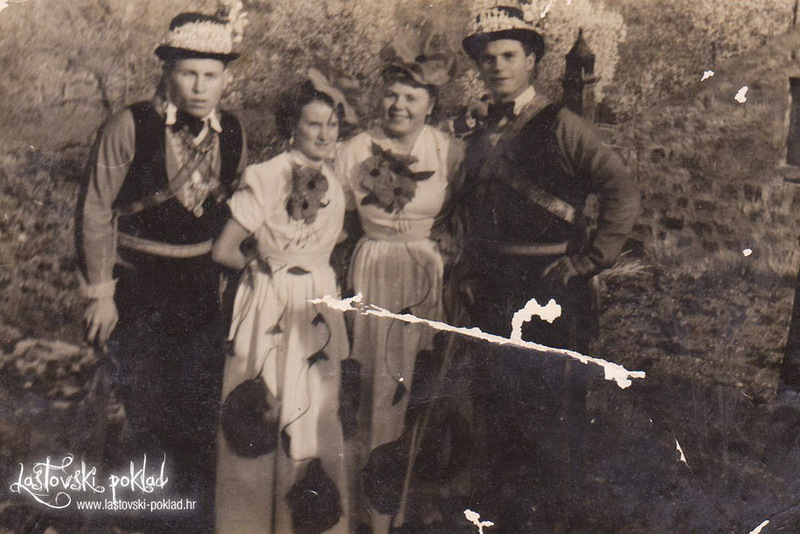 On the last Thursday of the Carnival season, the carnival group that was granted the Poklad puppet goes to call “Uvo!” by the tree in Gornja Luka for the second time. On that day, all the house terraces where the pokladari and pretty masques will dance on Shrove Tuesday must already have been made known. By Carnival Thursday, it is the Hall Master’s duty to have visited all the houses at which the male and female carnival processions will stop to eat, drink, sing and dance, in order to have made all the necessary arrangements with the hosts. 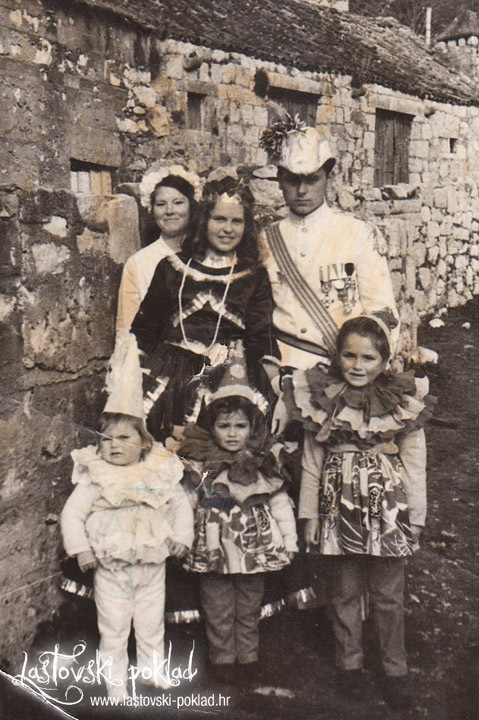 Since having carnival participants as guests is a serious obligation that is both physically and financially demanding, the Lastovo Carnival Association is ready to provide hosts with financial assistance. 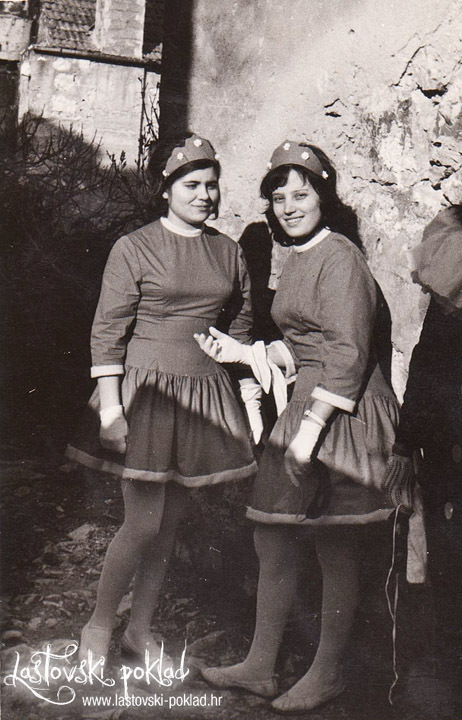 A regular dance evening (balo) is the only Carnival event held on the last Saturday of the carnival season, while Carnival Sunday is a big day for Lastovo’s youngest inhabitants. During the afternoon, the children’s carnival is held at the Hall. All the children from the village arrive imaginatively masked, accompanied by their mothers or nursery-school teachers, and occasionally a father or two who record the event with their cameras. They first walk through the village, and then everybody gathers at the Hall where the carnival group provides music. They sing, dance, eat cakes and drink juice until dusk, when everyone goes home. In the evening, there is another dance for adults at the Hall, this time without masks. On this evening, even those who do not belong to the carnival group become aware of what the Hall Master does. 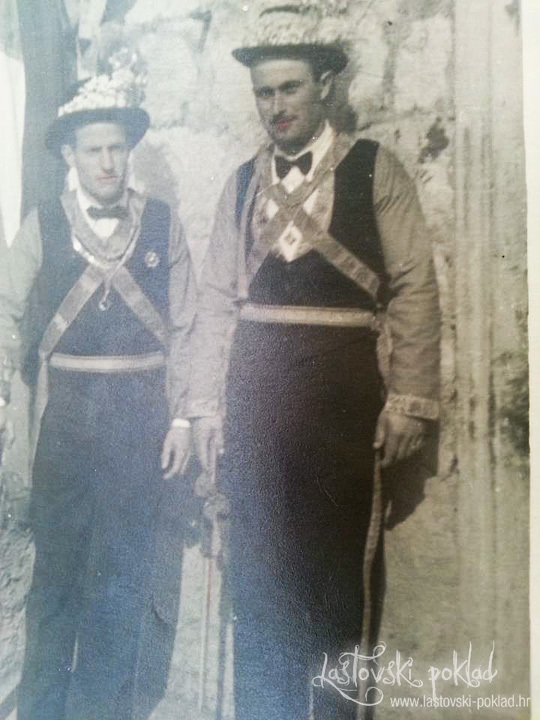 After everyone has had their fair share of waltzes, polkas and other dances at the last Sunday dance, the Hall Master and a group of male carnival participants (pokladari) leave at around 11 o’clock to call “Uvo!” for the third time. Upon their return, dancing and fun continue and the Hall Master announces the lyre dance (balo pod liru). The lyre dance is formed of male/female pairs that are linked together with handkerchiefs, moving around an imaginary circle. The dance, as its name suggests, is accompanied by a lyre. 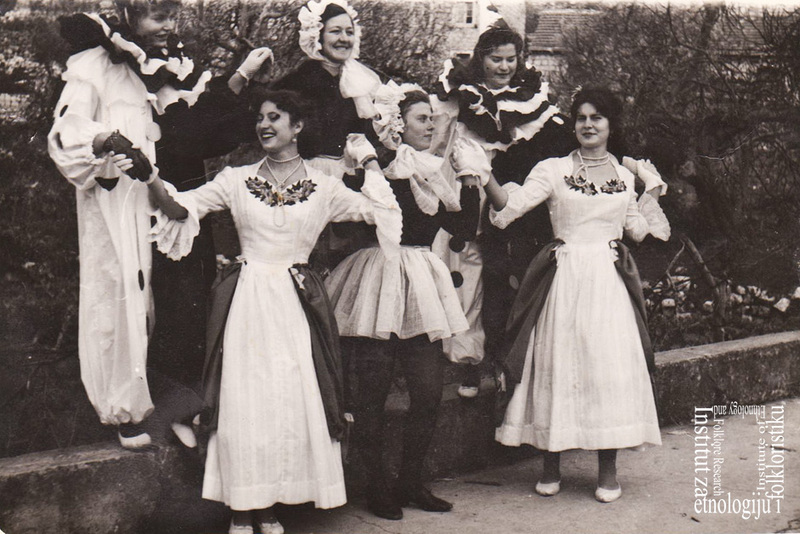 Since the lyre is played only during the Carnival season on Lastovo, the lyre dance is an integral part of carnival customs. It is danced spontaneously only at this time of year. Outside of the Lastovo Carnival context, it can only be seen on stage. It is normally danced during dance evenings in the Hall, usually towards the end of the evening or when the Hall Master decides so and announces the dance. Following unwritten rules, the lyre dance has to be danced at least three times in the period between Candlemas Day and Carnival Sunday, but it can also be danced more often. 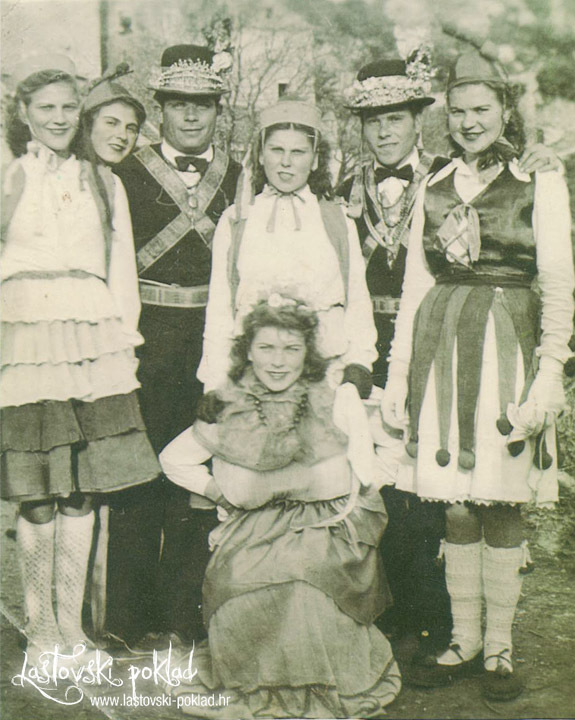 The last, humorous dance movement, which is not specifically mentioned in the Statute proposal, is actually a tag game played by each couple, the so-called laćenje pod liru. First a man chases a woman by running around the other dancers who are standing pressed together densely in the imaginary circle, and then the woman chases the man. When all the pairs have had their turn at the game, they divide into two groups and call “Uvo!”. That marks the end of the lyre dance, but fun and dancing last long into the night. At 8 o’clock on Monday morning the final preparations for Shrove Tuesday, when the Carnival reaches its peaks, begin. 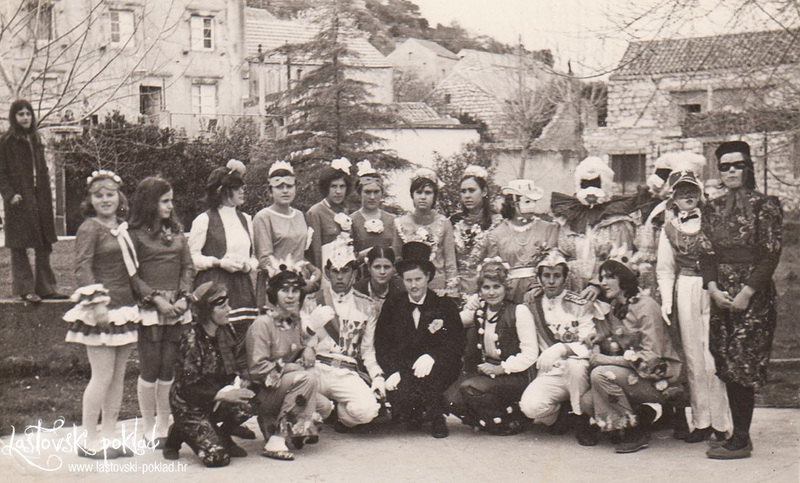 While women finish their costumes and iron men’s carnival uniforms at home, several male carnival participants (pokladari)wearing everyday clothes, an officer from the pretty masques’ procession (also in his everyday clothes), the lyre player, some children and the Hall Master gather outside the Hall. Shortly after 8 o’clock, the group goes to fetch a donkey. They are accompanied by the lyre, but they do not sing. 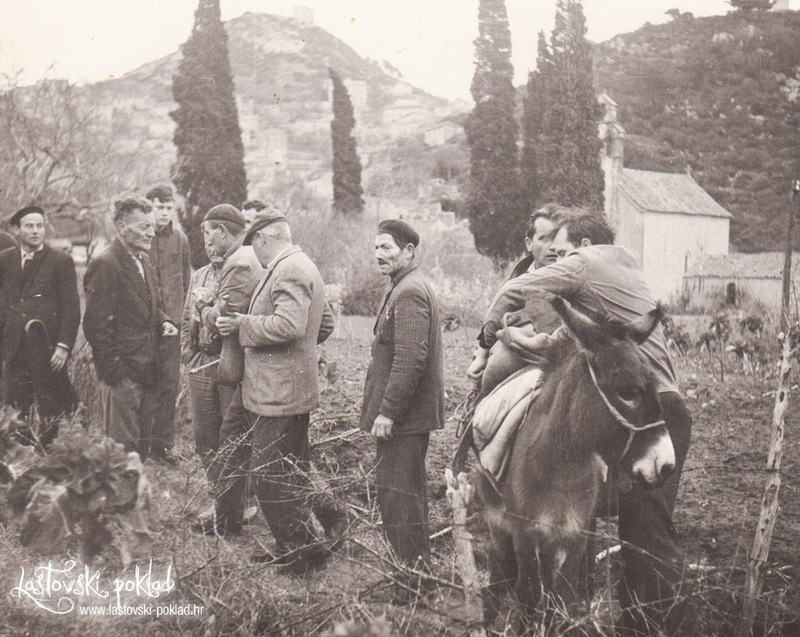 The men enter a house for a “welcome drink”, and the hostess hands over the donkey along with a hoe on its back, which they will use to dig the soil needed for making the Poklad puppet. Children and visitors interested in the event (photographers, journalists, tourists, researchers) stay in front of the house waiting for the procession to continue. Upon leaving, one child leads the donkey and is followed by the lyre player who continues to play, and – together with the rest of men, but still not singing – they go to get prlina, or the soil for the Poklad’s boots. Prlina is dug at a specific location at the end of the village, opposite the cemetery, under a particular olive tree. The pokladari say that the soil at this spot is softer than elsewhere. When they have filled two sacks with soil and loaded the donkey, the procession goes to get the tailor and the material needed for making the puppet. As soon as they have passed the cemetery, the Hall Master indicates to the men in the procession to start the song A Small Group Went into Battle, following the same pattern as the previous day: the Hall Master calls out the first line of the song, and then everyone sings it together. The procession stops in front of the house where they called “Uvo!” the night before, and where all the component parts of the Poklad puppet are kept. 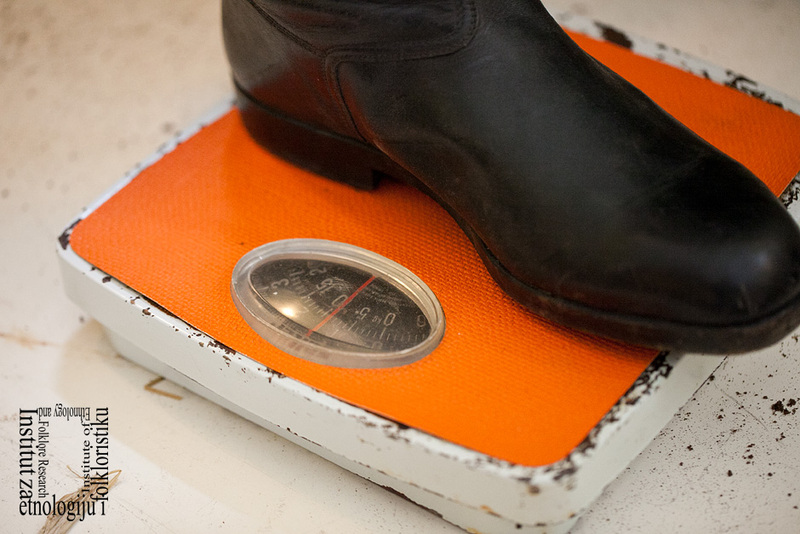 Only grown-up men are permitted into the tailor’s house, where they eat and drink. They then leave the house together along with the tailor, who carries two chests containing tools for making the puppet and its clothes. Together with the chests, two large sacks full of straw and a pole on which the puppet will be put are then loaded onto the donkey and taken to the Hall. In the meantime, the bomb maker and his assistants have already arrived at the Hall. From the moment the procession enters the Hall until lunch, the lyre players keep taking turns playing. A lyre player, sitting next to the table upon which the Poklad is being made, plays into a microphone and speakers set up in front of the Hall transmit the music to the whole village. The bomb maker and his assistant make bombs in the Hall by wrapping a specific amount of gunpowder first in aluminium foil, and then in packing paper, together with fuses of different lengths. After that, in front of the Hall, other assistants wrap up a test bomb and connect it to a rope that is stretched between trees to keep it taut. As soon as the test bomb is ready, it is set off in order to check the quality of both the gunpowder and the bomb making. At the same time, the Poklad puppet maker and his two assistants make the Poklad of wheaten and oaten chaff and hard fishing net. The making of both the Poklad and the bombs has to be finished at the same time, and no later than noon. When the Poklad is dressed, the Hall Master takes it out in front of the Hall. The gathered pokladari call “Uvo!” and another bomb is set off, this time to mark that the making of Poklad has been finished. It is then placed behind a window in the Hall, where it will stay until 1 o’clock in the afternoon on the following day. 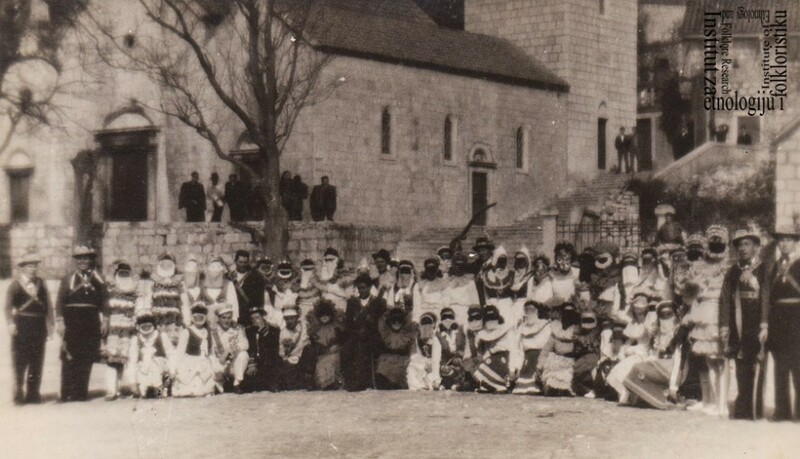 When this process is over, there is a lunch at the Hall organised for men only, including the members of the carnival group, the priest, the head of the municipality, former pokladari and a few guests. Eggs are collected by the so-called ugly masks that, in groups, go through the village in the afternoon hours. 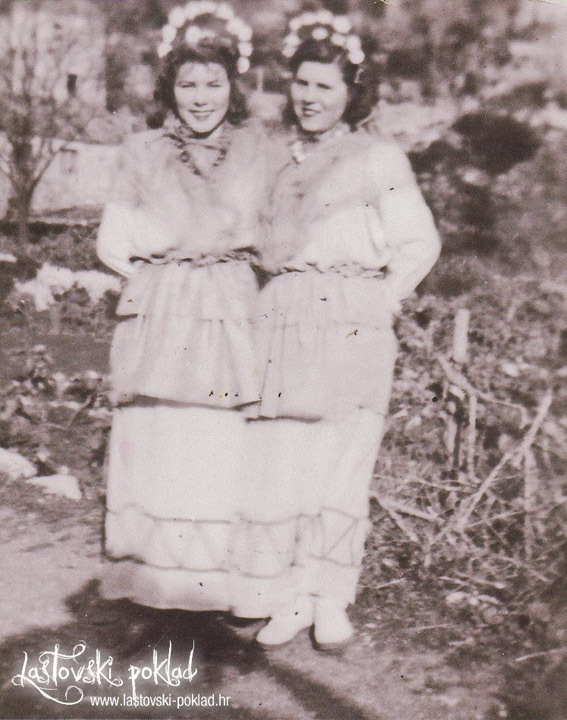 They owe their name to the fact that they are dressed in old clothes and their faces are blackened or mottled with lipstick. In contrast to the pretty masques of Shrove Tuesday, the ugly masks of Carnival Monday make a deliberate effort to look ludicrous and ugly. 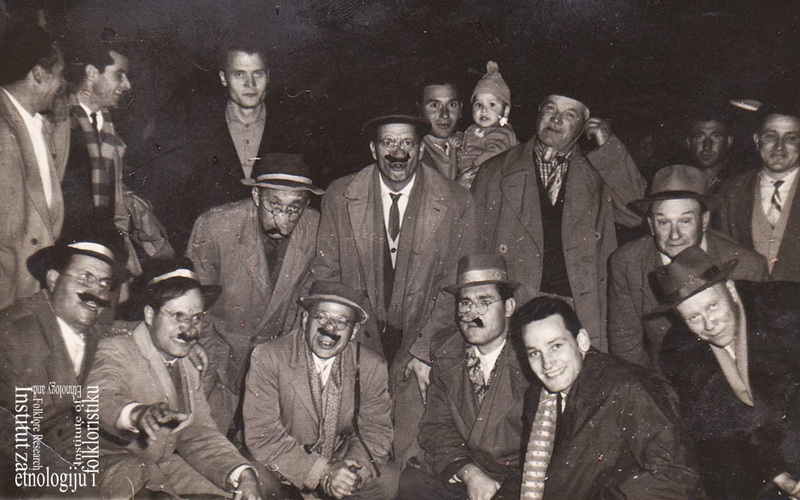 One of the groups of ugly masks is made up of men that will participate in the Carnival as pokladari on the following day. This is the only group that goes through the village accompanied by lyre. 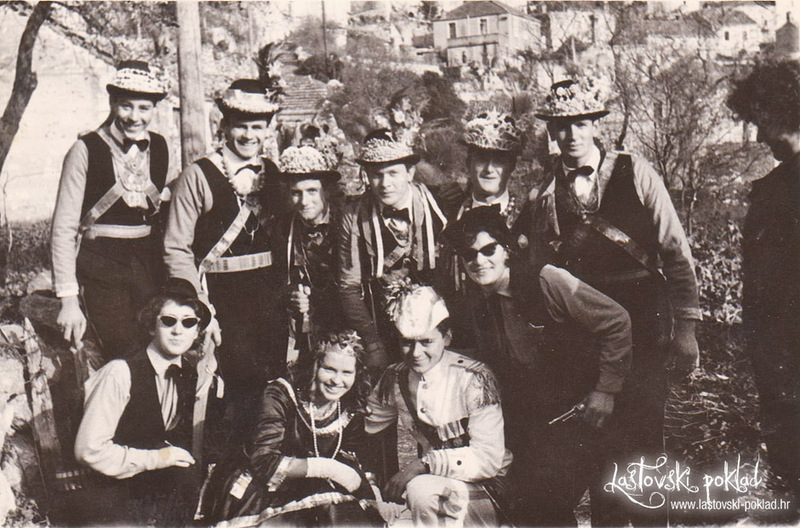 In years gone by, this group was made up of members of the carnival group that was entrusted with the Poklad puppet, and it was this group’s duty to collect the eggs. 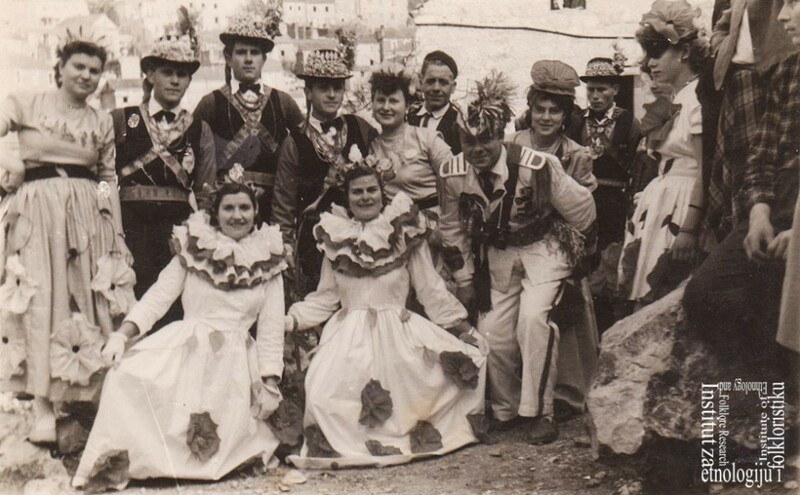 In the past few years, however, there has only been one carnival group of Lastovo pokladari. The ugly masks made up of pokladari are now the only ones whose duty it is to collect eggs, adhering to certain rules; the other groups of ugly masks can, but don’t have to, participate in the collection. 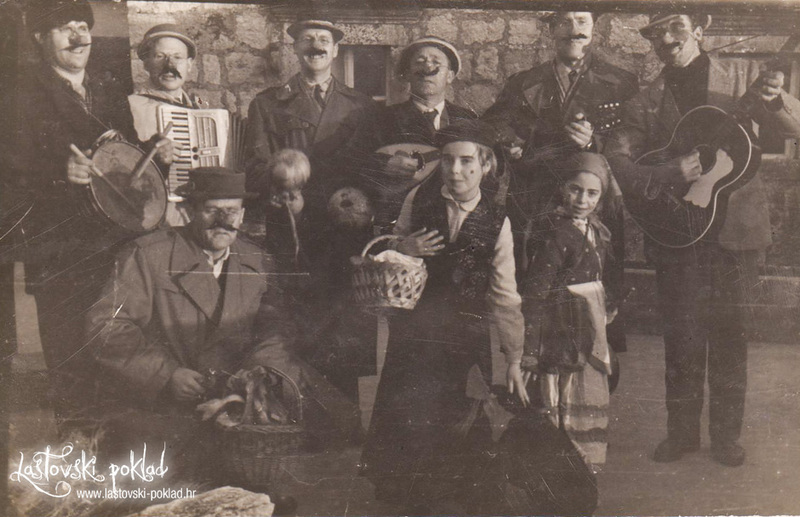 The group of pokladari first gathers in the Hall where the Hall Master gives them egg baskets and tells them which songs to sing during their tour through the village. They walk the same route that the pokladari will walk on Tuesday, and the whole group also enters the houses that the pokladari will visit on the following day. They stop to call “Uvo!” on the terraces where the pokladari will dance. There they eat and drink, sing a song, and move on. Two or three members of the group are the egg collectors and they run from house to house, introducing themselves with the password lyre. The hosts give them eggs, and they quickly go on, visiting in this manner all the houses in the village. They put the eggs in the baskets that the Hall Master has prepared for them. Eggs are collected until the evening bell sounds in the church. When the bells sounds, the group goes to the Hall, leaves the baskets full of eggs and goes home. 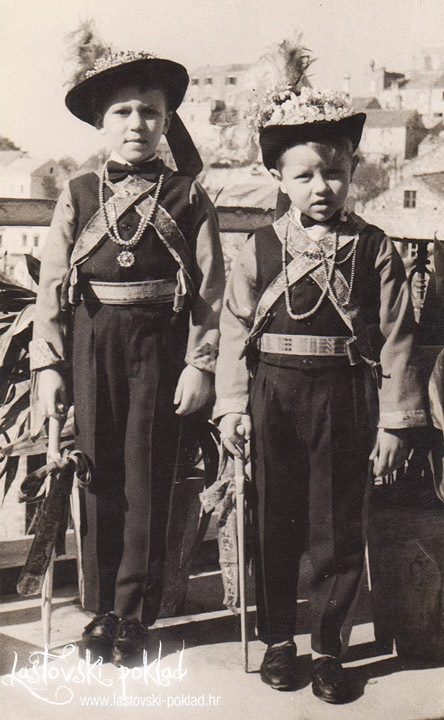 Another group of ugly masks consists of masked young people, both boys and girls, who go through the village accompanied by an accordion (or some other instrument) to collect eggs. Nursery-school children are accompanied by their teachers, and primary-school children are accompanied by a guitar player. Before entering houses, these groups sing: “Egg, madam, egg, madam, please give us an egg.” None of the masked groups should start collecting eggs before the main group – the one accompanied by lyre – does so, and none of the groups should walk in front of this group. If the lyre is in a house, another group waits until it leaves before entering. When the evening bell sounds in the church, the egg hunt is finished and the masks go home. 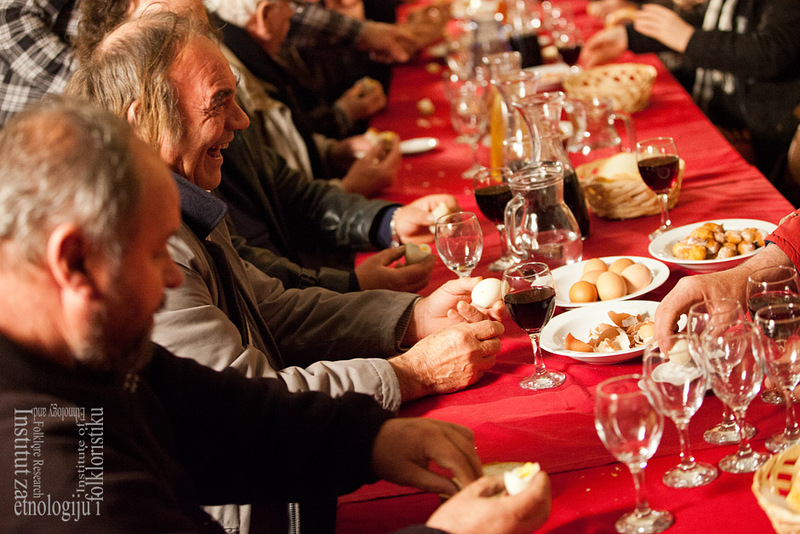 On Ash Wednesday evening, in the Hall, they prepare and eat the eggs they have collected together, paying for them in order to collect money to cover the costs of the Carnival. 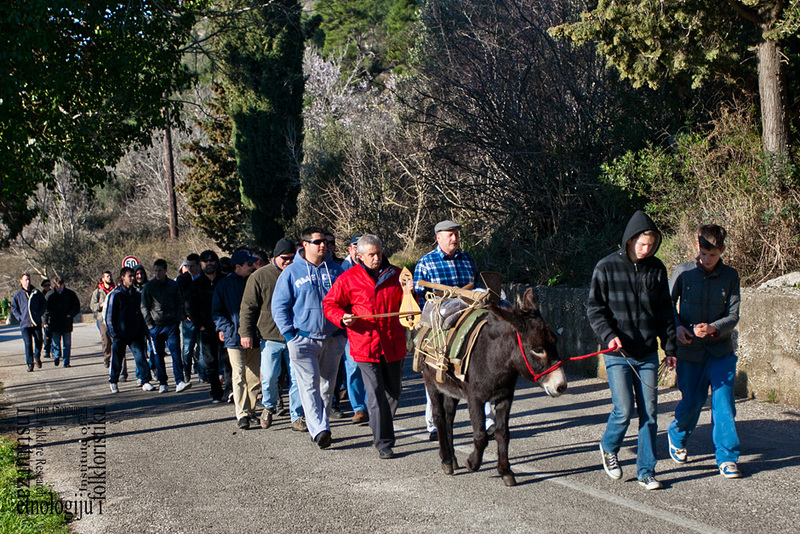 This is a day when few of Lastovo’s inhabitants go to work. The church bell sounds at 11 o’clock instead of noon, signalling that it is lunchtime. At 8 o’clock in the morning, the Hall Master, a lyre player and several male carnival participants (pokladari) gather in the Hall. Accompanied by the sound of the lyre, they go to collect the rope (uza) at the house where it has been kept the whole year. The rope will be used later that day for lowering the Poklad puppet from the top to the bottom of the village. The rope is then carried to Novi Put (the road that leads to the centre of the village and is situated at the level that is halfway between the top of the hill above the village and the bottom of the village). There the rope is soaped so that the Poklad will slide down it easily. The lyre is played constantly. One end of the rope is carried to the top of Pokladareva Grža (Carnival Hill), and the other is lowered to Gornja Luka at the bottom of the village. As soon as the rope is stretched out taut, the crowd calls “Uvo!” and a bomb is set off, signalling that the rope is ready for lowering the Poklad puppet. 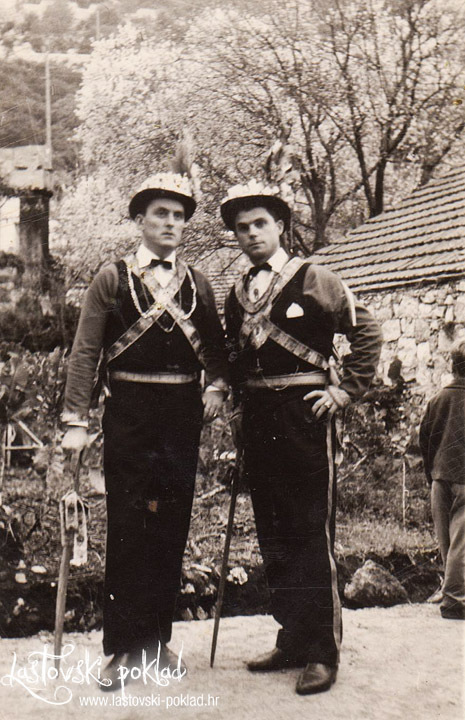 At the same time, old chests are opened in houses all around the village of Lastovo, and the carefully kept uniforms worn by pokladari are taken out. Women help men to dress. Women that will take part in the pretty masques’ procession get dressed only after all the men have finished dressing. 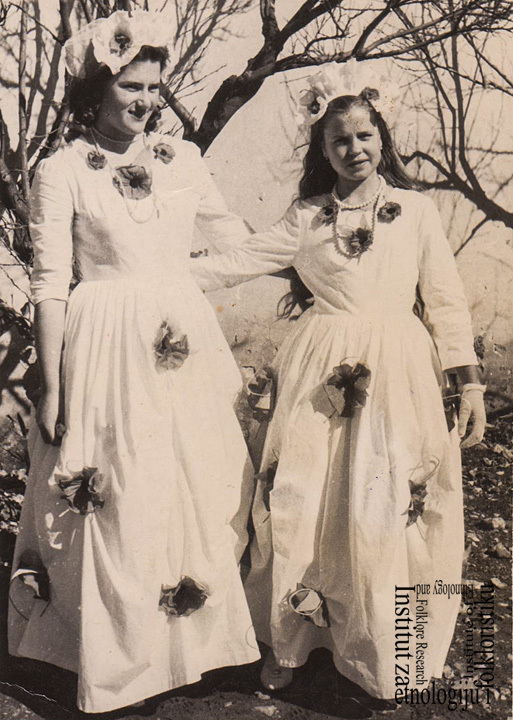 The procession consists of pairs of women, usually friends or cousins, who are dressed identically. 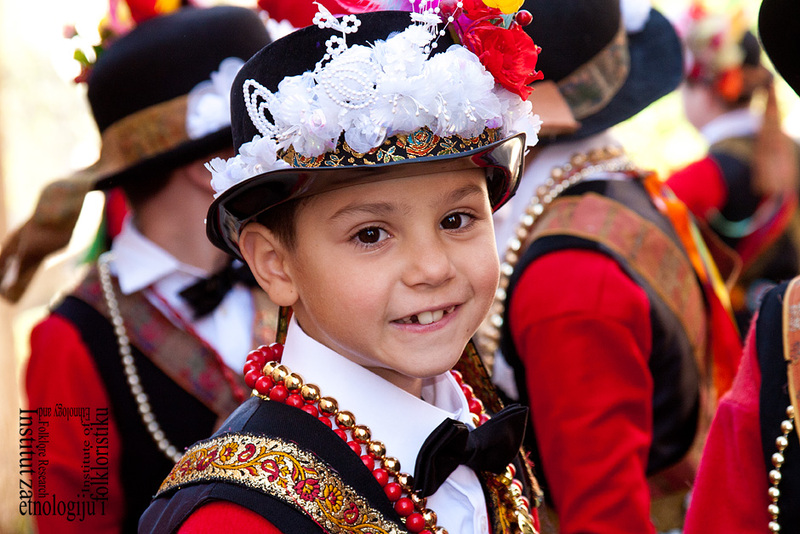 Each pair designs and makes their own costumes, which are normally worn only once – on Shrove Tuesday. Some of the costumes include popular cartoon animal characters, sirens, fairies, queens, Romany women, clowns or unspecified, but always very colourful, masks. The women start creating masks as early as the Christmas season, going to the city of Split to buy fabrics and other materials. All pretty masques, regardless of their costume, have to wear masks over their eyes during the whole procession. The event’s rules of conduct have been clearly defined. There are always two processions going through the village: the male carnival participants’ procession and the pretty masques’ procession. 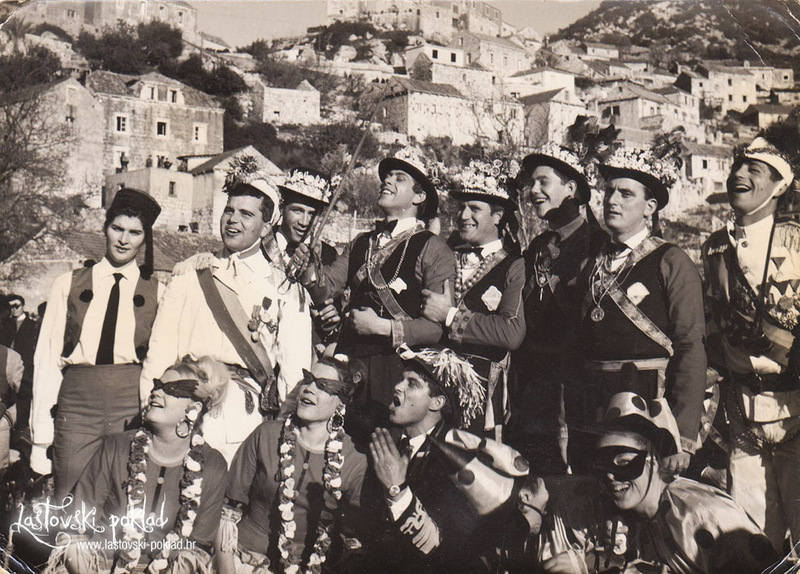 The male participants’ procession, which is made up of men from Lastovo solely, is the first and main procession and considered to be the backbone of the Carnival. Another procession, made up of pretty masques, has rarely been mentioned in literature, despite its impressiveness. It is made up of women. Around ten men or so, dressed as officers, accompany the pretty masques on their way through the village, maintaining order and supervising the procession. A third, smaller group, the so-called ugly masks, sometimes joins the carnival events as well. 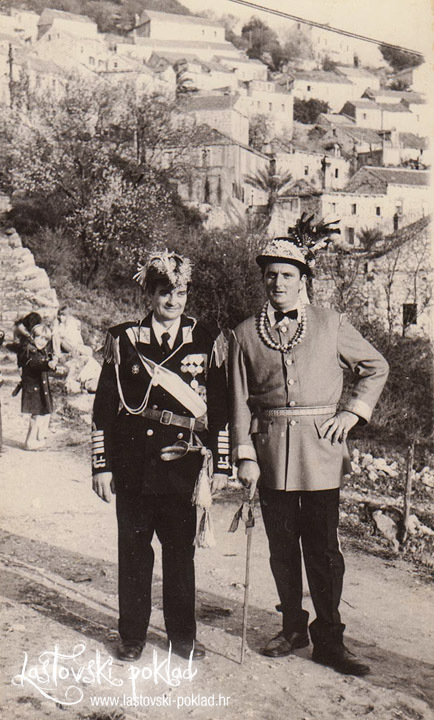 It consists of young men dressed as doctors that go through the village with the pokladari and pretty masques in turn, making jokes and amusing the audience and the procession participants. The pretty masques start gathering in front of the former cinema at around 9 o’clock in the morning. The pokladari gather in front of the Hall somewhat later, after noon. They always stand in line in the procession, two by two. The partner that arrives first at the gathering spot keeps the pair’s place in the carnival line. The same goes for pretty masques; they stand in line in the order they arrive. There is one exception to this rule; senior pokladari and pretty masques are always allowed to stand at the head of the line, since it is difficult to dance the final circle dance if you are standing at the end of the procession. The ringleaders, the Hall Master and the lyre player are the last to arrive. 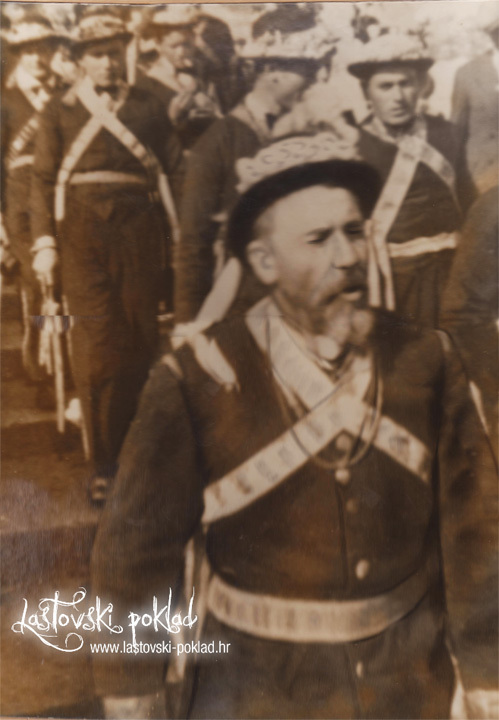 At 1 o’clock in the afternoon, after 25 to 30 pairs of pokladari have gathered in front of the Hall, the Hall Master indicates the start of the procession through the village. 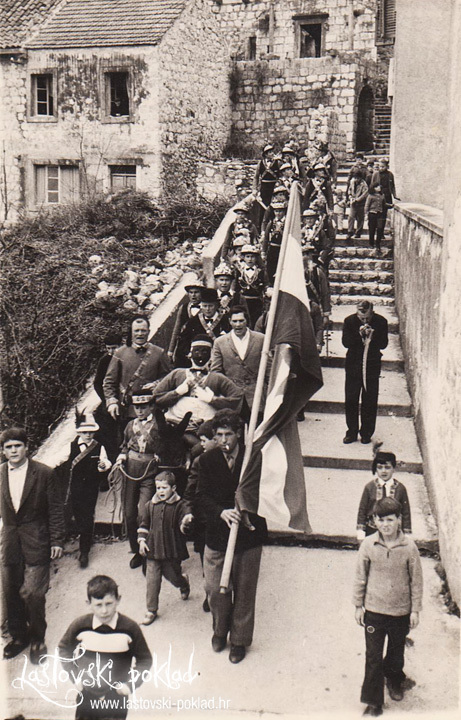 First comes the flag bearer carrying the Croatian flag, followed by the donkey carrying the Poklad puppet and children dressed in the same uniform as the pokladari. Then come the lyre player, the Hall Master, the pair of ringleaders and the rest of the procession in the order they have arrived at the Hall. There are also children that walk at the end of the procession. Accompanied by the sound of lyre, but not singing yet, the procession goes to the house of the Head of Municipality to ask for permission to lower the Poklad puppet on the rope from the top to the bottom of the village (this is called culjanje), and then burn it. The Head of the Municipality gives his permission in a short speech and shakes hands with the Hall Master. The ringleader then gives the command: “Dismissed!” and the most festive and important part of the carnival custom can start. 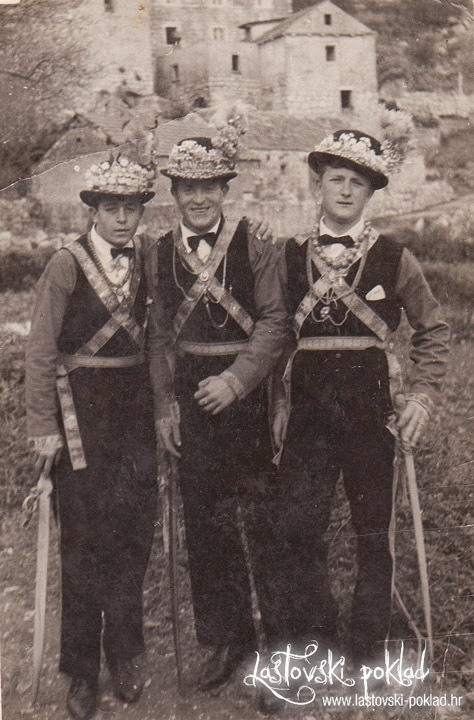 The pokladari, led by the ringleaders, dance a short version of their circle dance and move on to the priest’s house, this time singing as well, since they have permission from the Head of the Municipality. In the meantime, around 40 pairs of pretty masques have gathered as well. At about the same time as the pokladari withdraw to the Hall to listen to the Hall Master’s final address, the pretty masques enter the cinema hall where, away from the public eye, their leader greets them with a speech that focuses on desirable conduct during the procession. The pretty masques’ procession consists of pairs of identically dressed masks that stand in a line in the order they arrived at the gathering place. At the head of the procession there is a boy dressed as an officer, carrying the national flag. He is followed by a lyre player wearing a pokladar uniform, and by officers dressed in black and white who are not actually part of the procession, but who walk alongside and around it for supervision. When the male participants’ procession has left the Municipality building, the pretty masques’ procession arrives. They greet the Head of the Municipality and dance their own circle dance for the first time that day. At the same time, the pokladari are at the priest’s house, where they receive his blessing to continue with the carnival events. 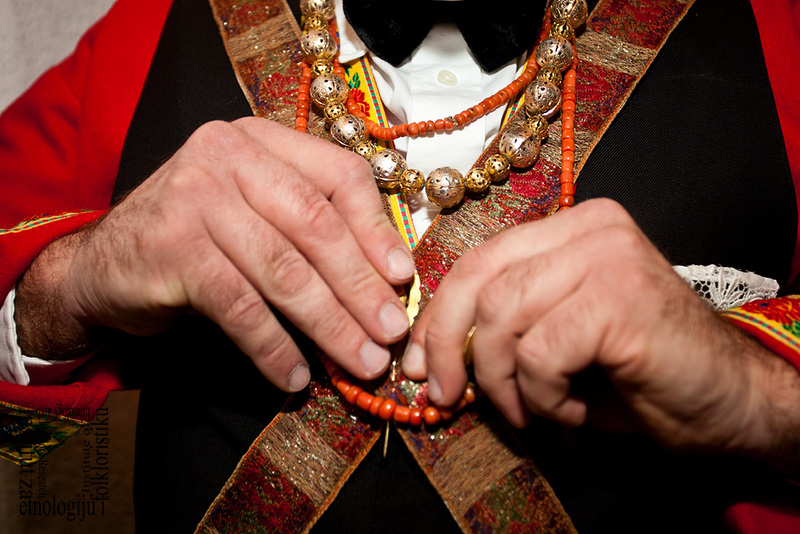 The ringleader takes the pokladari to the first of the house terraces that have been previously agreed upon, and decides how many pairs are going to dance the short version of the male participants’ circle dance. 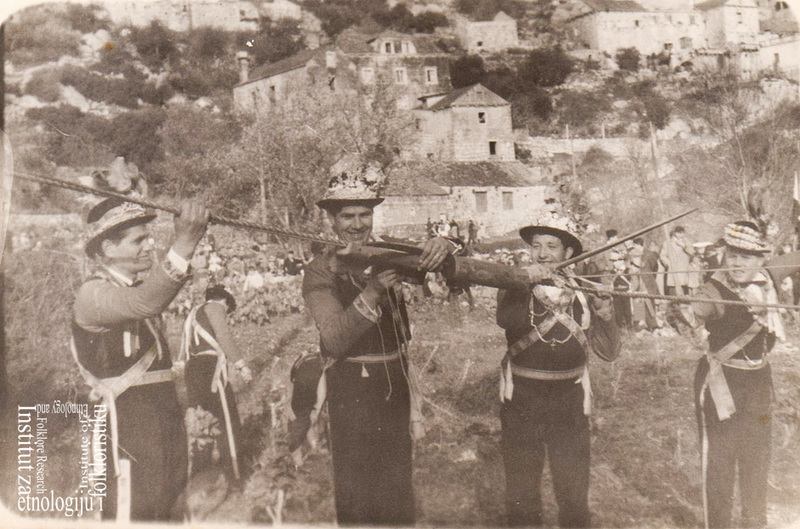 The male participants’ circle dance is a chain sword dance that is danced in its entirety by the natives of Lastovo dressed as pokladari on Shrove Tuesday only. Some of the circle dance figures are performed at terraces during the procession through the village. The number of pairs dancing depends on the size of the terrace. Besides the ringleaders, who are indispensable on this day since they are responsible for the circle dance’s success, a different set of couples dances on each terrace. The first ringleader decides on the spot which figures will be danced on any given terrace. While five to six couples dance, the other twenty or so couples watch, or they treat themselves to drinks, cold appetisers and cakes. Once the dancing is finished and the obligatory “Uvo!” has been called, the lyre player, the Hall Master, the ringleaders and all the pokladari that have danced on the terrace enter the house. The host welcomes the guests, and offers them food and drink. After they have spent a short time feasting and socialising, the procession leaves the house and moves on. Lagging behind the pokladari, the pretty masques go through the village as well, careful to obey the rule that the two processions should not meet. They visit the same houses as the pokladari have (these visits have been arranged with the hosts beforehand), but the pretty masques are always at least one house behind them. On each terrace, the ringleaders start the circle dance with a few pairs from the procession. 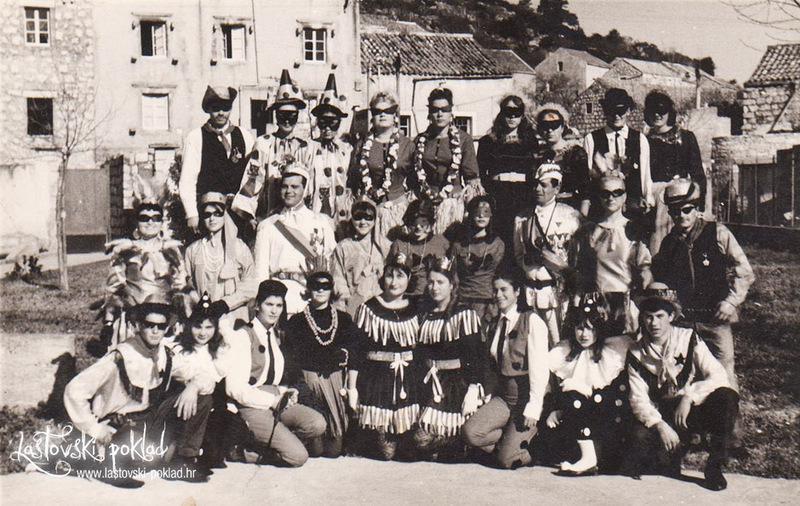 At the Head of the Municipality’s and at the priest’s houses, officers lead the pretty masques’ circle dance. 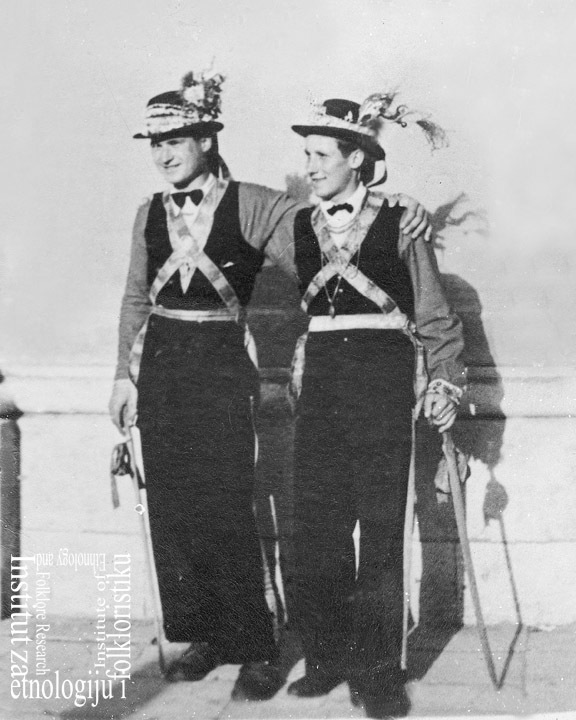 They perform a few dance figures that are very similar to those danced by the pokladari, the only difference being that the pretty masques use handkerchiefs instead of swords. They call their circle dance simply “our ‘kolo’”. Although the basic, very simple dancing step is the same as in the male circle dance, the pretty masques do it in a much more relaxed and easy-going manner, which characterises their circle dance in general. The simplicity of the dance steps allows for endless repetition, which in turn makes it all look more like a gallop than a dance. 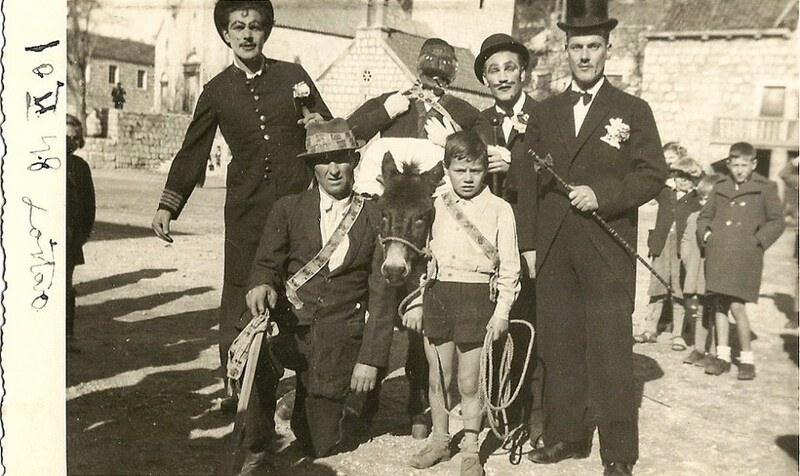 The procession through the village continues until 2:30 in the afternoon, by which time the donkey carrying the Poklad puppet must be at the bottom of the village, in Gornja Luka, which is the destination for the puppet after it is lowered on the rope. All of this is taken care of by the Hall Master. The Poklad puppet is then taken off of the donkey, and the carrier, who has been chosen by the Hall Master, carries it on his shoulders to Pokladareva Grža (Carnival Hill), the hilltop that is the starting point from where the puppet is lowered. While the Poklad puppet is being taken up the hill, the pokladari, led by the man who is in charge of the rope, stretch the rope out. The lyre is played tirelessly all this time. On the hilltop, the Poklad puppet is met by the bomb master and his assistants. They fasten the Poklad puppet to the rope, together with the bombs that will detonate on the way down. At 3 o’clock sharp, the Poklad puppet is ready to be lowered on the rope. 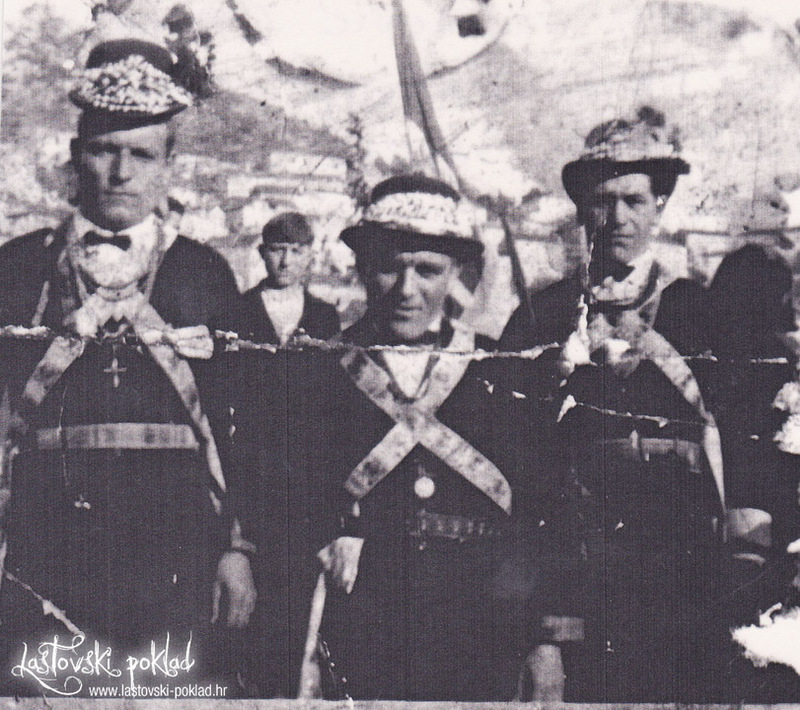 As the Poklad puppet is being lowered down the rope (culjanje), which constitutes one of the most important moments of the ritual, the pretty masques stop at the last terrace before Gornja Luka and wait for the pokladari to continue with their procession. 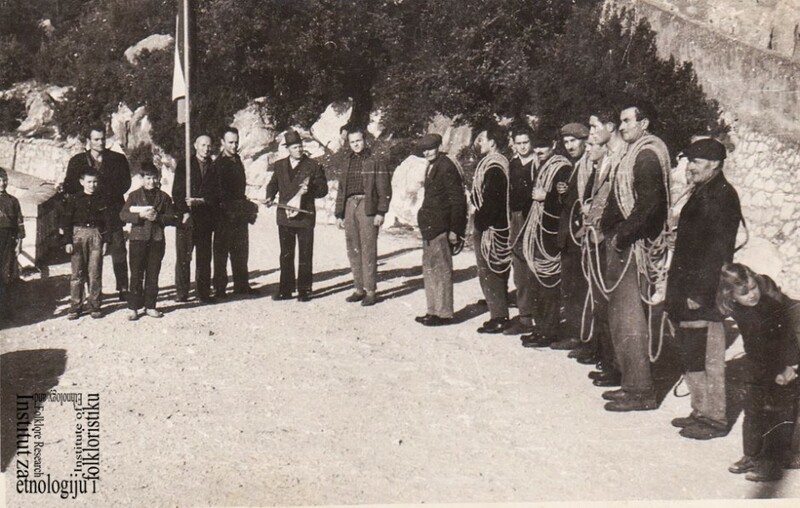 The Poklad is lowered on the rope three times, accompanied by the explosions of the bombs hanging from it. Five gunpowder bombs fastened to its feet are set off on its way down the first time, seven bombs the second time, and nine bombs the third time. The rope is then taken down and carried to the place where it will be kept until the next year’s events. The Poklad puppet is put on the donkey once again. After the Poklad puppet’s three trips down the rope, which have been witnessed by the pokladari and the gathered audience, the pokladari perform their circle dance. This time all of them dance and they perform all the figures, after which they are photographed before going on with their procession through the village. Only then do the pretty masques arrive, after having watched the lowering of the Poklad from the sidelines. When the pokladari have finished their circle dance, the pretty masks perform theirs. It has half as many figures as the male version, since it is impossible to perform certain figures without swords. After having danced and being photographed, they too continue with their procession through the village, again following the path of the pokladari, but somewhat behind. 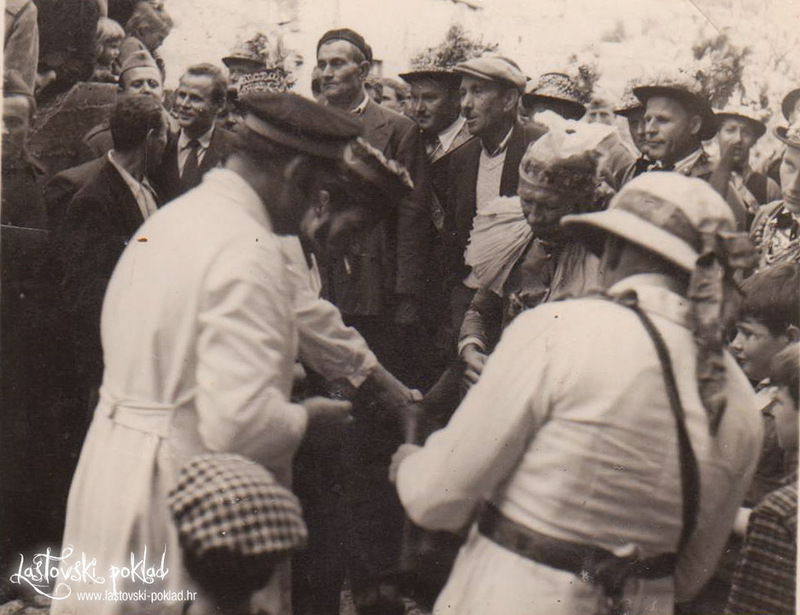 When they have visited all the houses in which they have been expected and it is around 6 o’clock in the afternoon, the pokladari arrive at Dolac Square, where the festivities reach their peak. Dolac Square is located between the village’s primary school and the parish church. On Shrove Tuesday evening, between 300 and 500 people gather there. The flag bearer with the flag and the donkey with the Poklad stand to the side. The lyre player takes his position in front of the church, and the central part of the square is occupied by the pokladari. This time, too, the pretty masques stay behind at the last house, waiting for their turn to appear at Dolac. In the middle of the square, around fifty male carnival participants start dancing their circle dance at the ringleader’s signal. 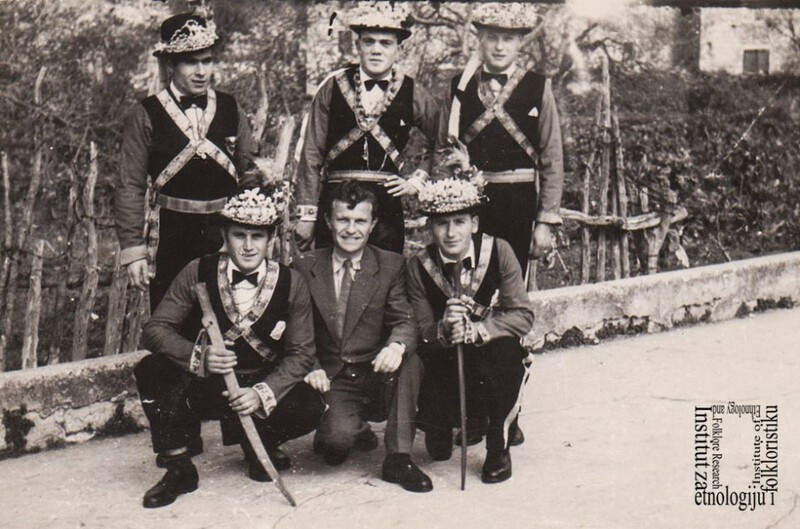 On this day only, pokladari in their uniforms perform the entire male circle dance, which is to say all of its ten dance figures and their repetitions. The ringleader decides on the order in which the figures are repeated, depending on his dancing ability and mood. As the pokladari dance their circle dance at Dolac, the pretty masques are nearing the end of their procession through the village. The last terrace on which they dance overlooks Dolac Square. When the pokladari have repeated certain figures a few times, and the Poklad puppet has been taken away so that its clothes can be taken off before it is burned, the pretty masques start heading for the square, but – as they themselves say – they are “late as always”. So the pokladari dance their circle dance alone, doing multiple repetitions until the arrival of the pretty masques. 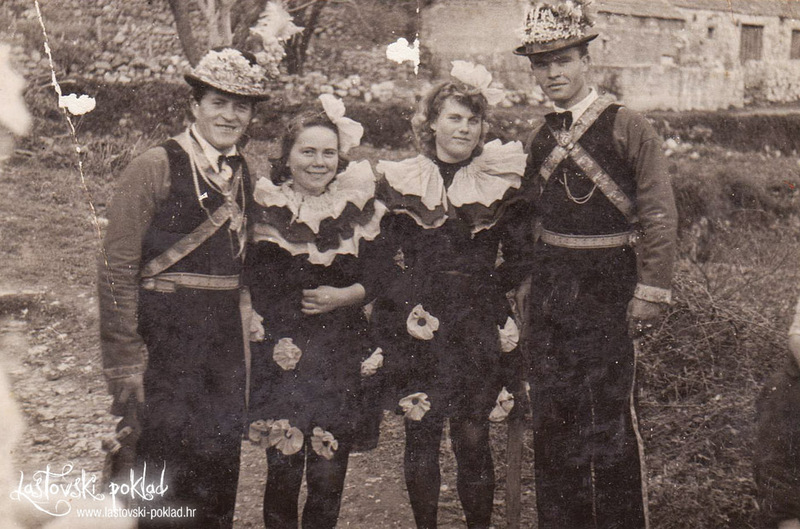 Once the pretty masques have arrived to Dolac Square, the pokladari – without stopping their own dance – make room for the pretty masques’ circle dance. For a while, they dance their respective dances alongside one another, but the pokladari do not perform all the figures of their dance anymore, only the simpler ones. After a few repetitions of certain figures, amale ringleader indicates that the two circle dances should merge into one and the male and female masks mix with one another. However, the pair of male ringleaders always stays together. 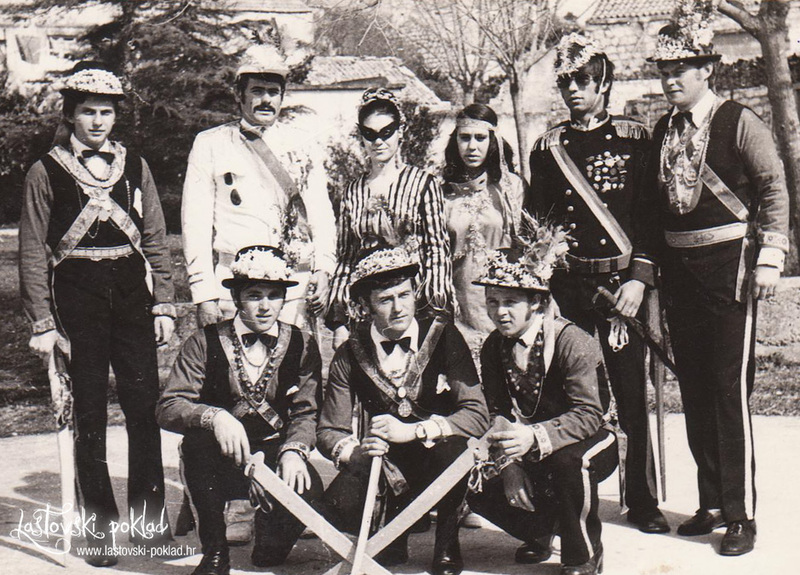 Other participants are arranged behind them as follows: first one of the officers, then the first female ringleader, and finally each pokladar followed by one pretty masque. At that moment, there are around 100 or more performers at Dolac, dancing together in a big kolo. They repeat simple figures perpetually, almost running, which results in a nearly trance-like experience for the dancers. Although the dancers are reaching their limits, as it has been a very intensive and demanding day for all of them, no one gives up – they have been waiting for this moment all year. No one gets ill on the following day, although most of the pretty masques have been dressed rather scantily, and the temperature in February can get quite low (around 0°C). The atmosphere reaches its peak when the undressed Poklad is put on a pole, paraffin is poured over it and it is burned. The Hall Master goes around Dolac with the burning puppet at the end of the pole until he arrives to the centre of the square, where he holds the puppet up until it burns completely. All the pokladari and pretty masques then gather together, singing and rejoicing until the church bells ring, indicating that the festivities have ended. Pokladari gather around the donkey and return it to its owner, accompanied by the lyre. They then see the lyre player off to his house and finally go back to their own homes, to rest and have supper. The pretty masques also go home to warm up a bit and have some rest, since the evening is not over yet; after supper, the whole village gathers again at the Hall for a dance that will last until dawn. 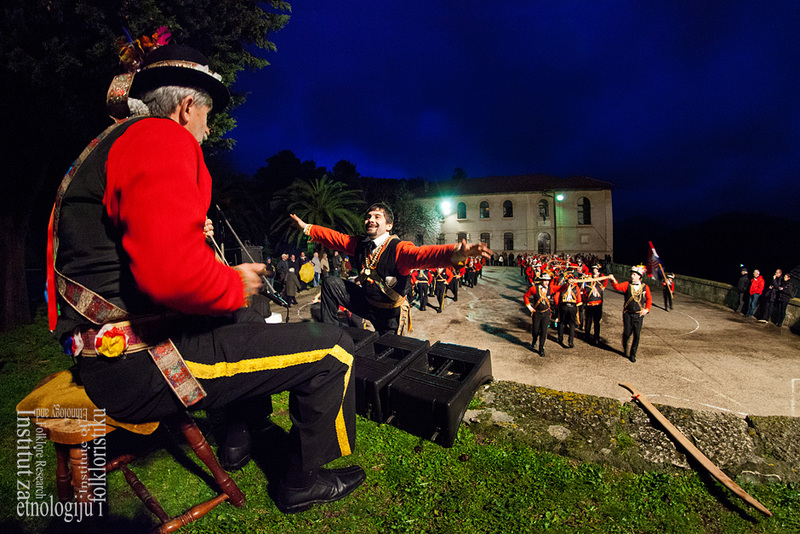 This is how that eventful Tuesday ends, a day filled with song and dance – the most important day of the year for the inhabitants of Lastovo. On Wednesday morning Lastovo is particularly peaceful. As early as 4.30 a.m., most of those who returned to the island or arrived there for the first time to take part in or to observe the Carnival events – high school and university students, the Lastovo natives who work in Split, Zagreb or abroad, soldiers, researchers and tourists – are already on the ferry back to Split. If they can afford it, the employed inhabitants of Lastovo take a day off from work and sleep through most of the morning. In the evening, the carnival group organises a final gathering at the Hall. Everybody who took part in dance evenings and carnival events is invited to contribute to help cover the financial costs of the Carnival. The carnival group members offer their guests small deep-fried doughnuts called prkle and hard-boiled eggs, the same eggs that the ugly masks collected on Carnival Monday. The Hall is then closed and everyone goes home. 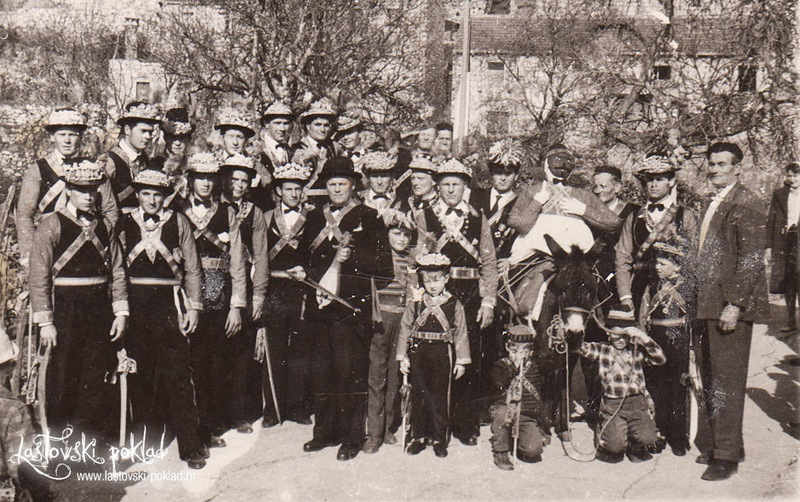 Egg hunt – a group with the accordion player Antun Jurica, M.D.